Asphalt 8 is a racing game created by Gameloft. It costs $.99 and is available on the iPhone, iPad and iPod touch. The objective of this game is to finish races as quickly as possible. This will earn you stars and money which can be used to unlock more races, cars and seasons. 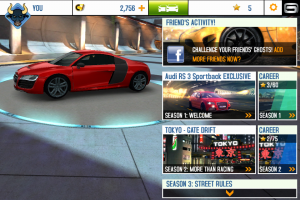 Asphalt 8 provides users with 8 seasons, 180 events and 47 high-performance cars. So you will definitely get a lot of playing time out of this $.99 game. In addition to race modes Classic, Versus, Elimination and Knockdown, you can also play Infected and Drift Gate modes. In Classic you race against other racers. Whoever comes in first gets three stars. In Versus mode you either win or lose, because you’re only racing one other car. In elimination mode the person in last place gets eliminated every couple of seconds, and whoever is last wins. In Knockdown you have to knockdown the most cars to win. The other mode, Infected, turns the last car into an “infected” car. This racer will have unlimited Nitro boost, but he will wreck if he doesn’t run into other racers before a timer runs out. If the timer runs out he loses the infection, and someone else is picked. Whoever crosses the finish line wins in Infected. This game features drifting, Nitro boost, perfect nitro boost as well as ramps, barrel rolls and 360 flat turns. Not to mention that you can also knockdown other racers by driving them into buildings or hitting their tires. You can also player simultaneously with up to 8 opponents in multiplayer, as well as dare friends to asynchronous races. There’s also something called a “Ghost” challenge. This is where you race yourself from the past. The ghost does everything you did in a previous race, and you have to beat them. This game is really fun and it has plenty of stuff to do in it. It’s highly unlikely that you’ll get bored of playing it within the first 10 hours that you have it. From race tracks all over Europe, Iceland and the USA, to the shortcuts you can use, to the amazing music, this is simply an amazing game. Asphalt 8 has really great graphics and music. It also runs really well on the iPhone 4. A lot of new games are starting to not perform so well on older devices, this game runs flawlessly. While playing Asphalt 8 I wasn’t able to find any glitches or major problems. However I wish that crashing into other racers or walls was more realistic. A lot of the times I my car by a rock wall and didn’t wreck, or I barely touched another racer and it knocked them down. I have only played Asphalt 6 or 7 in the past, and I never thought much about the whole series. Asphalt 8 changed my mind about it though. I think Asphalt 8 is an amazing game with a lot of content for players to go through. For just $.99, you’d be crazy not to get it.